Earlier this July, The Bookseller (the UK trade journal for the book industry) posted an article heralding a new boom in horror fiction. “Horror and ghost stories are rising from the literary grave and seeing a resurgence in sales,” ran the strapline. The last horror boom—an unprecedented surge in demand spawned by Stephen King’s arrival on the scene in the 1970s—did not end well. Although many lovers of quality horror fiction were only too glad to call time on the seemingly endless glut of fourth-rate slasher narratives and Rats rip-offs, the unforeseen consequence of the bust was that even the best horror writers—anyone who wasn’t Stephen King, in fact—began finding it close to impossible to land a book deal. Horror sections in bookstores were dismantled, their contents parcelled out to crime and the newly-fledged dark fantasy. For agents and publishers alike, horror became the great unsellable. Perhaps it simply needed time to put its house in order. While some of the trash novels that led to this loss of commercial appetite for horror fiction will ultimately come to be regarded as classics of their kind (for those interested in which these might be, I cannot recommend highly enough Grady Hendrix’s hilariously entertaining survey of pulp horror of the '70s and '80s, Paperbacks from Hell), what seems to have happened to horror during its decade in the wilderness is that it has come out stronger and more certain of its literary identity. Of course for those who love horror fiction, it never went away, and indeed the first intimations of a horror renaissance were being felt long before mainstream commentators—those Johnnies-come-lately—became aware of them. As long ago as the late 1990s, writers such as Caitlín R. Kiernan and Laird Barron began drawing their inspiration from older weird fiction—the work of H. P. Lovecraft in particular—and laying the foundation stones of what was to become a horror renaissance. For Barron and the writers of the New American Weird, a return to roots seemed essential and proved transformative, steering horror firmly away from splatterpunk and towards a more contemplative, psychologically meaningful aesthetic. As this “new horror” gathers momentum, the influence of Lovecraft is becoming less ubiquitous. New writers—many of them entering the field from outside the horror genre—are discovering new possibilities and new approaches within old archetypes. For much of the nineties and through the early 2000s, the only place to find new horror fiction was in the small press, through imprints whose relatively modest circulation and high cover price put them outside the reach or knowledge of all but the most dedicated specialists. We now find ourselves in a situation where both horror fans and general readers have a whole new library of future classics to explore. 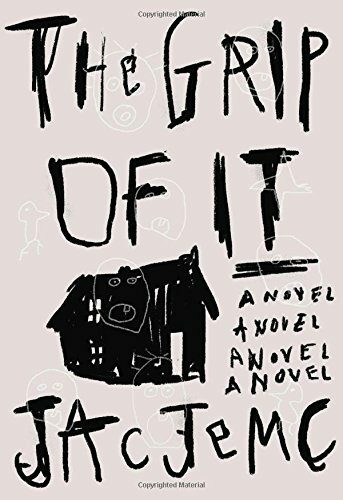 One of them is The Grip of It, by Jac Jemc, published in 2017 by Farrar, Straus and Giroux, a staunchly literary house that—forgive me—would not have been seen dead dealing in horror fiction even ten years ago. James and Julie have just moved from the city to a rambling old house in the woods. With only one close neighbour, their new situation is unlike any that either of them is used to and this is not the only reason for them to be nervous. James has recently confessed to a gambling addiction. Julie believes that a complete change of scene and new jobs for both of them, not to mention the work they’ll have to put in on renovating the house, will help them overcome both James’s gambling and the damage their relationship has suffered in the wake of it. Julie’s friend and work colleague Connie has never been too keen on James, not least because Julie met him on Craigslist, hardly an auspicious beginning. Could shutting themselves off in the back of beyond be a step too far? The house is beautiful and cheap, though; larger than anything they could hope to afford in the city. Julie is adamant: this new start will be the making of them. Even at the close of the novel’s three hundred increasingly tense, densely suffocating pages, you could argue that her prediction turns out to be correct. To say the house is also almost the end of them does not begin to cover what lies in store. The first quarter of The Grip of It ingeniously colonises territory that at first glance appears familiar to anyone who has seen even a few haunted house movies: a young couple decide to move out of the city in order to escape their troubles (like James and Julie they could have money worries, or maybe one of them has had an affair, or else they’re recovering from a recent bereavement, often the death of a child) and although there are signs that the beautiful new house they have purchased might not be all that it should be (if it really is so wonderful, why is it so cheap?) they make the move anyway. A spiral of escalating bad stuff invariably follows. In the case of James and Julie, their first awareness of their predicament—as so often in these kinds of horror stories—is relatively minor. The house seems to have a voice of its own, a kind of low-level hum that never lets up, and has no apparent source other than the building itself. In their search for answers, our couple discover a series of internal passageways and storage voids, all inaccessible via normal channels and with no apparent use. At one point, Julie calls James at work, insisting she is trapped inside one of these false rooms, though when James rushes back to rescue her she turns out not to be trapped at all. They also discover that the house’s former inhabitants were the victims of one or maybe several family tragedies. Their only neighbour, the irascible Rolf Kinsler, appears to want nothing to do with them. Then he disappears. As their lives begin to spiral out of control, Julie suggests they go and stay with Connie for a while, just to get some perspective. Their troubles appear to follow them, however, leaving them with no alternative but to go back to the house. In the Hollywood version of this story, their return would precipitate a third act in which one of them comes increasingly under the influence of the evil presence, while the other heroically struggles to find the key to the haunting—the box of diaries in the attic, the faded newspaper articles revealing ancient feuds or foul deeds—and lay the ghosts to rest. Once again, it is striking how cleverly Jemc utilises these very conventions whilst at the same time subverting them entirely. Of course, a writer does not have recourse to flashy editing techniques, CGI monsters or manipulative music. It is virtually impossible, through mere marks on a page, to replicate the visceral immediacy of the cinematic jump-scare. With fewer opportunities for creative laziness, novelists almost have to come up with something different. Yet there is more than enough media-derived horror fiction around to show us there is more to it than that, that a great horror novel is more about the rejection of generic solutions—an army of the dead rising up from a swimming pool, mommy going mad with a hatchet—in favour of a willingness on the part of the author to actually imagine what might happen to these people, how they might really think and behave, why they don’t just switch on the lights and call the cops. New classics of the horror genre such as Andrew Michael Hurley’s The Loney and Catriona Ward’s Rawblood have reimagined the gothic in such a way that the path from then to now is solidly defined. We enjoy these books as much for their debt to nineteenth century horror as for their contemporary resonance. Other writers of the horror renaissance have produced work that seems defined less by old ghosts than by the ambient anxiety that characterises our age. John Darnielle’s Universal Harvester subverts the “haunted video” trope with a story of almost heartbreaking originality and pathos. In A Head Full of Ghosts, Paul Tremblay shows a family tragically caught in the grip of diverse social pressures. The Grip of It shares concerns and uncanny parallels with J. Robert Lennon’s equally masterful Broken River, a novel in which the “haunting” turns out to have a disturbingly real-world explanation. These are novels that go out of their way to subvert their originating premise—that a supernatural agency is at work—whilst still allowing room for it as a possibility. Perhaps the most moving sequence of The Grip of It comes after James and Julie are presented with a scientific explanation for their problems, which is that Julie has been suffering from a hitherto undiagnosed neurological condition. It is at this point that the couple finally find themselves again, picking up the threads of their closeness in their shared acceptance and knowledge that there may be more to what they have been through than what the doctors tell them. The Grip of It is a superbly achieved novel in which the twin threads of resolution and ambiguity are in perfect balance. Jemc keeps faith with her characters, never subjugating their needs and actions to the demands of a generic horror plot. Neither does she chicken out of telling what is, in the very best sense of the word, a horror story. Those readers who look for explanations will be offered them. Those who prefer to be left with a sense of mystery will be equally satisfied.